Back again in familiar territory in Westport, CT, Romeo + Baglio Design are pleased to announce the completion of their latest commercial project unveiling the look and feel of Whip Salon's newest location. The design team has transformed a 2,000 square foot industrial space in the beautiful new Bedford Square development, into a welcoming, spa-influenced haven featuring unique elements that offer a soothing yet distinctively hip vibe. "What I love about working with interior designer Andrea Romeo is that she can take something that is just an idea, and translate it into a tangible element that connotes everything I was going for. It's a pretty remarkable skill," said Whip Salon owner Amy Pal. "It's one thing to have kind of an idea of what you're trying to create, but to have the confidence to introduce all the right elements is something I go back to Romeo + Baglio for again and again." Andrea Romeo and Rebecca Baglio are the duo behind the project and have worked with Pal on previous commercial projects. "After consulting with Amy to get my head around her vision for the new salon, I really wanted to give the space a serene yet modern appeal," said co-founder and interior designer Romeo. "For example, the chandelier above the makeup counter was selected because it exudes a glamorous and unexpected contrast to other pieces in the space. While the industrial copper in the chandelier works really well against the exposed ceilings, to me the glass nodules make it appear to be dripping with jewels and forces you to take a second look. It's overall appearance lends just the right amount of softness." One of the most unique pieces is the refurbished antique drawers brought in for the makeup counter created by Naomi Maynard of Maynard Designs. "The finishing on the drawers and the handles were selected specifically to complement this space. We framed out a mirror above it with that same seafoam accent you can find elsewhere which creates a beautiful area for makeup artistry. Its also nestled between two enormous windows overlooking Church Street giving it a fantastic setting and that "wow" factor." 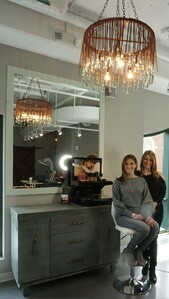 Whip Salon Westport's reception area is a scene-stealer in itself, "We wanted the client's first step through the doors to be a combination of edgy elegance and sophistication," said Romeo. Romeo + Baglio brought back the iconic WHIP moss letters flanked by modern sconces set against a bark-like textured wallpaper, flecked with gold. The reception area also boasts an impressive custom made wooden reception desk crafted by Backwood Builders, with a woodland wallpaper inlay in the same blue-green shade found elsewhere in the salon. "I think you need to experience the space to really appreciate all the layers that went into it," said Rebecca Baglio. "It definitely has a feel that's unique to any other salon in Westport, it's as if you have been transported into the city when you step inside Whip." Learn more about Whip Salon here.